Still a lot of work to do, but I’m just taking baby steps to get to play the complete concept, even if it’s not very polished. 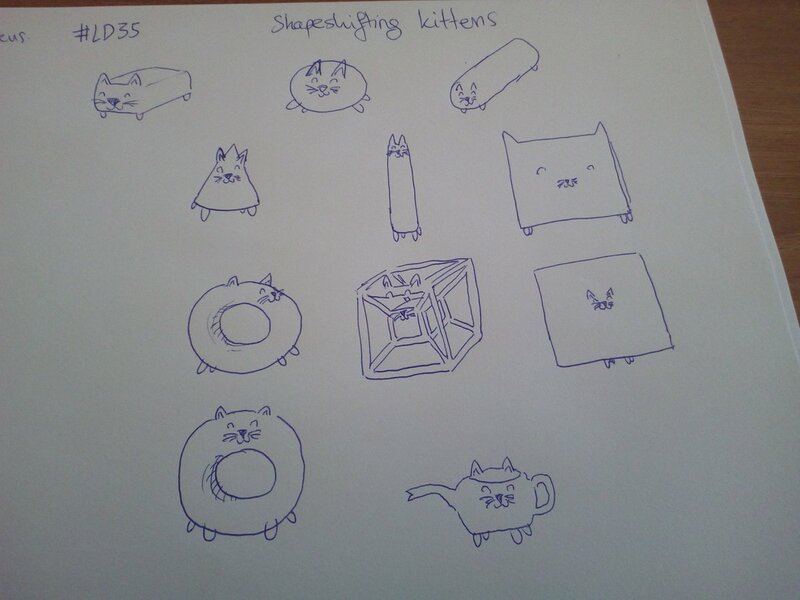 “Baby Caty & the shapeshifting kittens” is progressing. Spent most of my available time today working on the controller for the kittens. It’s not completely finished, but I got quite happy because some features I was expecting to be harder have been quite quick to implement. Partially thanks to the custom controller. Adding the baby (protegee and shaper of kittens) which uses the same base class with the kittens. Coding the specific abilities to each shape (that fit perfectly in my current architecture). If I get these completed then I can jump into adding some random obstacles and enemies. Since I have several ideas I can go for the easiest ones. Most of the appeal of this concept is in the control scheme and navigating with all your kittens through the slow and steady running scenery (trying not to leave anyone behind). After that I expect to have a funny enough game, worthy of that final push of tweaks, polishing and love. See you all on day 2! PS, I’m already getting a new perspective on this LD theme. I wasn’t very thrilled at first, but now I’m amazed by all the jammers coming up with really diverse game concepts and interesting ideas. I’m not new to Jams, but this is my first Ludum Dare. For some reason it has evaded me for too many times with life and things. This year it’s happening around my birthday which is a good excuse to clear out some time and finally dive into. Also my first born is due before next LD which means this may be my last chance for jamming in a long time. My plan is to take it lightly, even if I go too slowly. My goal is to to have fun and use it as a excuse to reconnect with some friends. As a start I kept awake last night to see the theme, today I’m calmly waking up and getting into the vibe. I may not have the whole weekend for LD as life still happens. Also I’ve wasted too much mental energy into mixing LD35 with my age because of my birthday… It would have been so prophetic. Thanks Juuso or I could have been tweeting forever alone during the jam. Now I’m heading to have a shower, because everybody knows that’s where all the good ideas come from. After that I’ll chew my way through my ideas and a proper late breakfast.